Overexploitation of marine species invariably results in population decline but can also have indirect effects on ecological processes such as larval dispersal and recruitment that ultimately affect genetic diversity and population resilience. We compared microsatellite DNA variation among depleted and healthy populations of the black-lip abalone Haliotis rubra from Tasmania, Australia, to determine if over-fishing had affected genetic diversity. We also used genetic data to assess whether variation in the scale and frequency of larval dispersal was linked to greater population decline in some regions than in others, and if larval dispersal was sufficient to facilitate natural recovery of depleted populations. Surprisingly, allelic diversity was higher in depleted populations than in healthy populations (P < 0.05). Significant subdivision across hundreds of metres among our sampling sites (FST = 0.026, P < 0.01), coupled with assignment tests, indicated that larval dispersal is restricted in all regions studied, and that abalone populations across Tasmania are largely self-recruiting. Low levels of larval exchange appear to occur at the meso-scale (7� km), but age estimates based on shell size indicated that successful migration of larvae between any two sites may happen only once every few years. We suggest that genetic diversity may be higher in depleted populations due to the higher relative ratio of migrant to self-recruiting larvae. 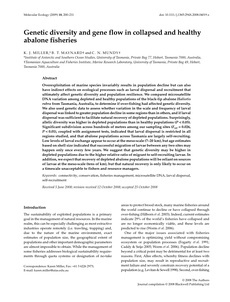 In addition, we expect that recovery of depleted abalone populations will be reliant on sources of larvae at the meso-scale (tens of km), but that natural recovery is only likely to occur on a timescale unacceptable to fishers and resource managers.